Depart from your Shanghai hotel in a comfortable, air-conditioned minivan and venture to the glittering district of The Bund under the ambient cover of evening. Begin by boarding a boat and setting sail on the Huangpu River, a body of water that divides The Bund into two sections. Gaze east and west as you view glittering lights and illuminated sights from your impressive vantage point on deck. Disembark the boat and commence a relaxed stroll around The Bund’s beautiful waterfront; visit the renowned Peace Hotel, an establishment that served as the center of Shanghai nightlife in the 1920s, then hop into a trolley to take a tour that culminates in spectacular views of Nanjing Road. Relax during the journey back to your Shanghai hotel where your enriching exploration of The Bund concludes. Bad experience. starting with the bad coordination in the schedule for the pick up at the hotel, the tour included a trip by train of tourism in nanjing and the visit to the lobby of the Peace Hotel, really waste of time. We had to wait 40 minutes for our tour on the river, which could have been avoided if we had arrived earlier to the dock or at least bought the tickets in advance. the guide Frank always walked like 5 meters before us very hurried without considering the participants. During the 40 minute wait he could have taken the opportunity to explain something about the city but he left us alone in the waiting room. We were called to get to the line very late and were placed in the middle of the boat, without the option of having a better view unless paying a VIP pass. I do not recommend the tour. It is preferable to take the metro or taxi and get there and take pictures of the lights from The Bund. This tour was unfortunately affected by the national public holiday, which meant we missed our first boat and had to wait 40 minutes for the next. This tour was still a highlight of our Shanghai visit. The boat was large and comfortable. We would recommend getting to the top or back of the boat for the best experience as the other areas are internal. The cruise is of adequate length and the view is amazing! Make sure your camera has a good night mode. I think this is the best way to see the bund and Huangpu River. It really set the tone of our visit! Love Shanghai!! Really nice tour. Travel back hundreds of years in a few hours. Awesome sights and private guide picked up at Hotel and was very courteous and friendly. Highly recommend if traveling alone!! Tom was a great guide that kept us all together and told us about Shanghai on our way to the boat dock. 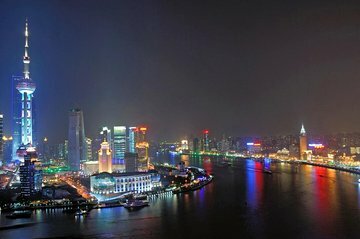 For those traveling on business that have an evening free, this is a great little trip to see the Bund and Pudong area of Shanghai by boat. A good tour although not the best. We were not lucky because of the rain pouring down while doing the boat trip. 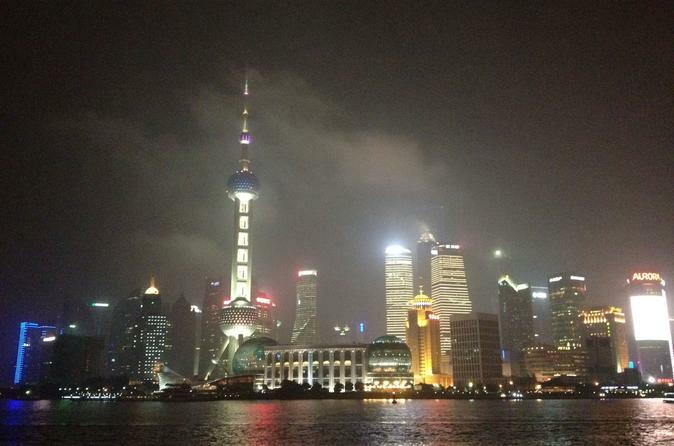 The rain also prevented us from making the stroll alongside the river enjoying the view and the well lit Pudong area. The tram was not fascinating and our guide behaved more like a coordinator than a guide. In the end we were unloaded from the minivan in front of some hotel not ours and we spent good 20-30 min waiting in the cold weather for our guide to find a taxi to bring us back to our hotel which was very disappointing. If I have to do the boat trip I would definitely go with a private option, but the boat ride and night views have to be seen while in Shanghai, just pick a private tour.